The media sectors studied differed in the degree to which they focused on African Americans in their coverage over the course of the year and in the angles they pursued. Cable TV and talk radio devoted the most time, with 2.5% and 2.4%, respectively, of their newshole (time studied on their programs) containing significant mention of African Americans. But, with the exception of CNN, the attention came largely through one lens–political debate, from both sides of the aisle, over events involving prominent blacks such as President Obama. CNN, during the time period studied, stood out for having segments about African Americans that went beyond that political debate, with a special series, Black in America 2, as well as other pieces that focused on issues facing the black population. The attention this population received on morning network news, 1.5% of the total newshole studied, came heavily through coverage of the Gates affair. Beyond that event, the morning shows provided little African American-related coverage. Newspaper front-pages, also at 1.5% of the total newshole, offered perhaps the widest mix of African American angles. Some of the attention was tied to news events of the day, some came in the form of profiles of individuals and some as analyses of issues facing the country. Whatever the storyline, this coverage tended to delve deeper into the impact or significance for the broader black population. Just 0.9% of the news radio newshole included angles related to African Americans. 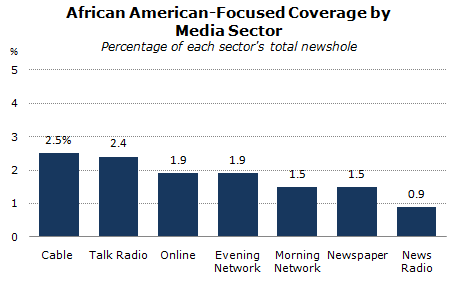 The differences across media play out in the storylines driving African American news coverage. 1. This includes PBS NewsHour.